Do you find that yourself drawn to certain pubs, when the weather starts to change? To me, the Lescar on Sharrow Vale road is an autumnal pub. It’s just one of those places that seems to get more cosy and inviting, the colder it gets outside. The Lescar is all about the real ale, comfort food, and Sunday roasts – a winning combination on a cold autumn day! The other thing I love about the Lescar, is its ‘friendly local pub’ vibe – right down to the books they provide for customers to browse and borrow. It’s hard to believe this place is just a few minutes walk away from busy Ecclesall Road! The Lescar is one of those places that’s much bigger than it looks from the outside. It also has a very interesting layout, with different areas that almost feel like they were separate rooms at one point. Just when you think you’ve seen everything the Lescar has to offer, you turn a corner and find a massive function room, complete with second bar. The Lescar’s menu has a very rustic, pub rub grub feel. All the classics are present and accounted for: cottage pie, burgers, fish and chips, sausage and mash, and steak. However, the Lescar put a little twist on these comfort food classics – here, the fish is done in tarragon batter, and the mash is made from celeriac. In addition to the pub grub mains, the Lescar also offers a variety of sharing platters, plus a good selection of small dishes ‘to start, snack or share.’ I’ve ordered a few things from the ‘start, snack, share’ menu when I’m suffering from the beer munchies, and I’ve always been impressed. I can highly recommend the salt and pepper squid, which the Lescar serves with a tangy and delicious lime mayonnaise (£5.25). The Lescar also have a Saturday brunch menu, which I’m desperate to try. Again, it’s classic comfort food with a gastro pub twist – the boiled egg soldiers are served with bacon jam, and the Lescar’s version of mushrooms on toast is Paris Brown, Flat and Oyster mushrooms served on rye with stilton cream. The Lescar have a lot to offer, but on this particular day it was all about the Sunday lunch. This is something I never really cook for myself, so Sunday lunch out always feels like a special treat. 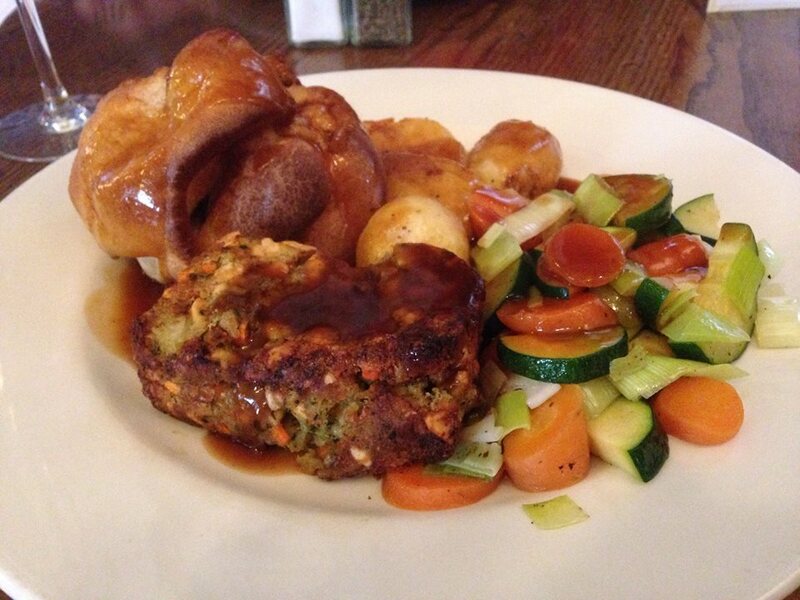 The Lescar offers the usual trio of meats (pork beef, and chicken) plus the obligatory nut roast vegetarian option. I opted for the veggie nut roast (£9.75) which according to the menu is made from cashews, peanuts, almonds, walnuts, cheddar, veggies and herbs. My nut roast Sunday dinner came with veggies, stuffing, roasties, Yorkshire pud, and gravy. Don’t you just love the sight of a big plateful of Sunday dinner? It’s amazing the difference good gravy makes to a Sunday dinner. The Lescar’s gravy had the perfect consistency, not too thick and not too thin, and it was really tasty. If I could make gravy half as good as this, I wouldn’t have to go out for my Sunday lunch! The vegetables were perfectly cooked, and I loved the combination of leeks, carrots and courgettes. The roast potatoes were crispy and salty on the outside, but light and fluffy on the inside – exactly what you want from a roastie. The Yorkshire pudding was big, misshapen and ugly, the surefire sign of a homemade Yorkshire pud. It also tasted even better for having been sat soaking in that delicious gravy. The nut roast had a nice, herby taste that reminded me of stuffing, and it was packed with nuts. The portion was also very generous, but it’s a good job because the nut roast had been overcooked to the point where I could only get my knife through the bit in the middle! Luckily, this was such a big plateful that after eating the middle of my nut roast, plus all the trimmings, I was pleasantly full and still felt like I’d got good value for money. I’d recommend this Sunday roast to all the veggies out there – although hopefully your nut roast won’t have spent quite so much time in the oven as mine! At the other end of the table, it was a less traditional Sunday lunch: a West Country beef burger, sesame seed brioche bun, melted Taw valley cheddar and fries (£9.25) with smoked bacon (an extra £1.25). This is more of a gourmet burger, as oppose to the weird-combination-of-toppings burger that places like the Harley and Bungalows and Bears specialise in. The brioche bun was tasty, the meat was nicely cooked, and the smoked bacon lived up to its name, packing a really strong, smoky flavour. My Sunday lunch buddy was also impressed by how much bacon he got for £1.25. 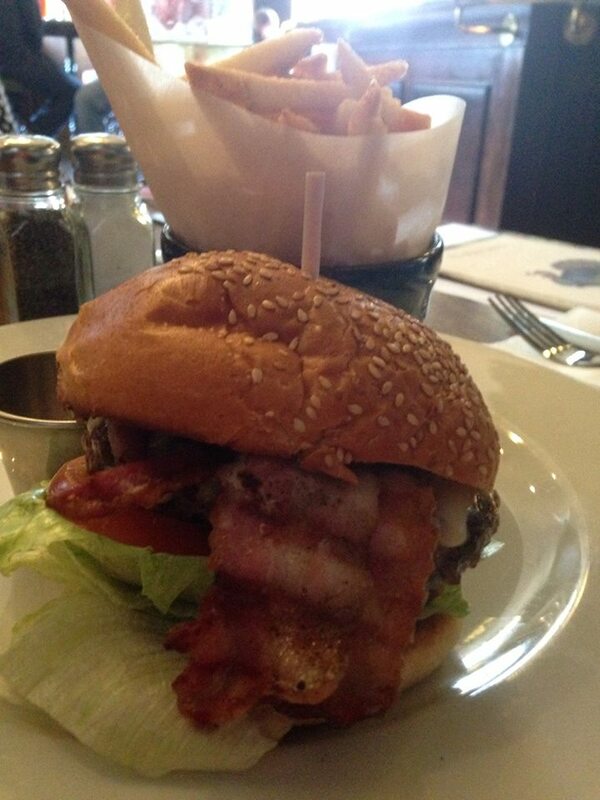 It may not be your traditional Sunday lunch, but this burger got a big thumbs up nevertheless! We left the Lescar pleasantly full, and plotting return visits so we could sample the Saturday brunch menu, plus an afternoon drinking session with added bar snacks. You know a place is doing something right, when you’re planning the next visit on your way home! The Lescar serve up filling, tasty comfort food in a warm and welcoming environment that’s perfect for this time of year. If you’re craving pub grub, real ale, and relaxed surroundings, then it’s well worth paying the Lescar a visit.